The thought of summer is almost over somehow sadden me. I don’t know if it’s because I feel that Minnesota has such a long winter. Though, with the summer is ending means Fall is around the corner. My personal favorite of all seasons is Fall. Windy, but the colorful leaves, the cooler weather, the fashion, the celebrations. My daughter on the other hand can’t wait for winter to come. She is ready to do some sledding. I think snow is always fun for the kids, but not for the adults who need to do some snow blowing and driving, not this adult right here. 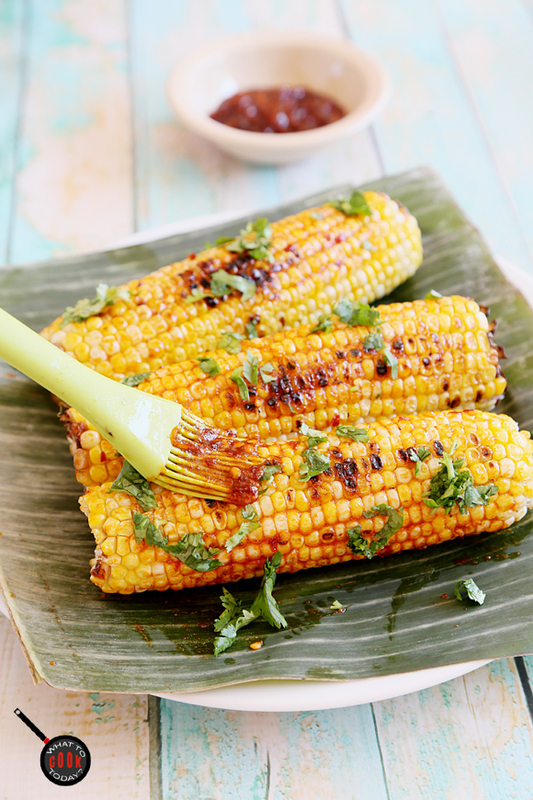 Anyway, I want to share this Indonesian-style grilled corn with spicy sweet chili sauce with all of you. There are still time to do some grilling. The weather is actually perfect this week in Minnesota. Not too hot and humid, just the right amount of breeze!! 🙂 It’s a street food that I grew up eating. I love corns with all my heart. Slab some spicy sweet chili sauce on them, there’s no holding back on these !! I seriously mean it! My husband absolutely love this. He loves the spicy and sweet chili sauce. The chili sauce is great for dipping other appetizers you have in mind too. Try it and I believe you’ll enjoy it too. I lined the plate with a banana leaf for photography purpose. We use lots of banana leaves in Indonesian cooking. The fragrant banana leaves are my favorite for sure. It can be used as a wrap or to line the plate as part of presentation. Preheat your grill. 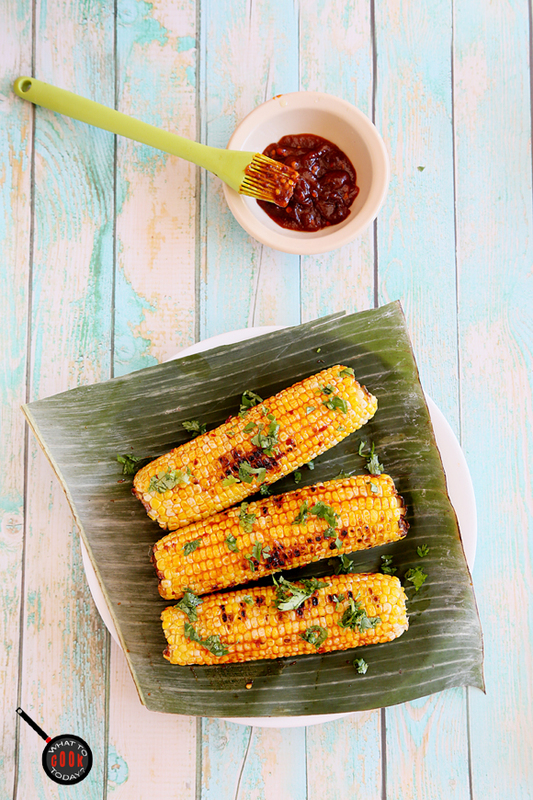 Place the corns on the grill and brush with some butter. 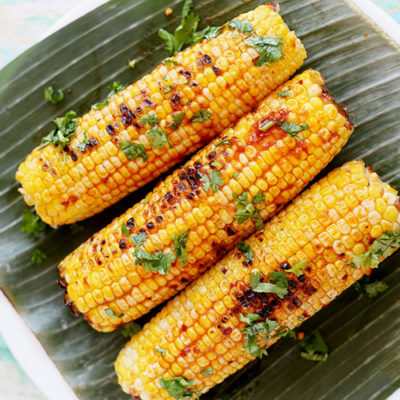 Let them grill until you have some light char on the corns. Turn them around as you grill and brush with more butter. 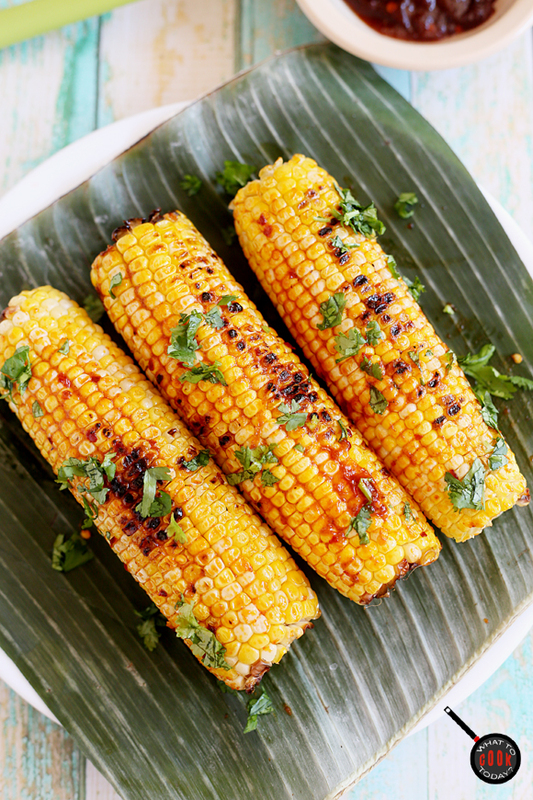 This grilled corn looks very tasty! These corns looks so good! Reminds me of those days when I would sit by the corn sellers in Brastagi. I have to say, I love your blog it reminds me of home.